In the most recent Federal Budget, the government announced it will be encouraging Australians to live longer at home before moving into aged care communities. Through its More Choices for a Longer Life package, it announced an extra 14,000 home care packages in order to ease the waiting list, which latest figures show includes more than 126,000 people. Currently, Australian seniors can receive care and support in their home, a retirement village, which is usually pitched at those aged 65-75 years old, or in a residential aged care facility, which is the high-care solution mostly for people aged 80-plus. have remained in their own home and are losing the ability to care for themselves and their home, but don’t wish to move into an aged care facility. Ageing within the home has been encouraged in Europe for years. The difference, Europe has already identified that they have a social isolation issue and has been working to find a solution to allow people to live at home longer, yet still be connected. I believe we need to consider the following two solutions to this emerging problem in Australia to provide greater choice to those wanting to stay in their home. A program-based solution, senior’s hubs allow people to leave their home to enjoy activities, socialisation and community interaction. In Europe, they are called ‘day care centres’ for seniors, however, they are more than that. We should be creating senior’s hubs that are conveniently stitched into their communities, allowing them to interact with others through activities that offer mental stimulation and social interaction, such as a cooking class. The key here is that people can choose to participate. This is done to a degree in Australia, however, the government is no longer sufficiently funding this form of care, however, this type of amenity has proven benefits. Become more flexible with our homecare packages and allowing seniors to choose how they want to spend their funding, that is not just on higher care but potentially on art or cooking classes to suit their needs. This would require government support. Overseas, there are some philanthropic organisations that provide this sort of support for seniors but in Australia, with lack of government support, this falls on aged care providers. We need to incorporate more of these facilities within new aged care developments to allow for seniors to access them. Many seniors are downsizing into a smaller dwelling or apartment, resulting in the need to explore additional ways we can support them as they remain within their own home. For example, incorporating higher care facilities within the same location that allow for light assisted living, with opt-in in-home care when required. 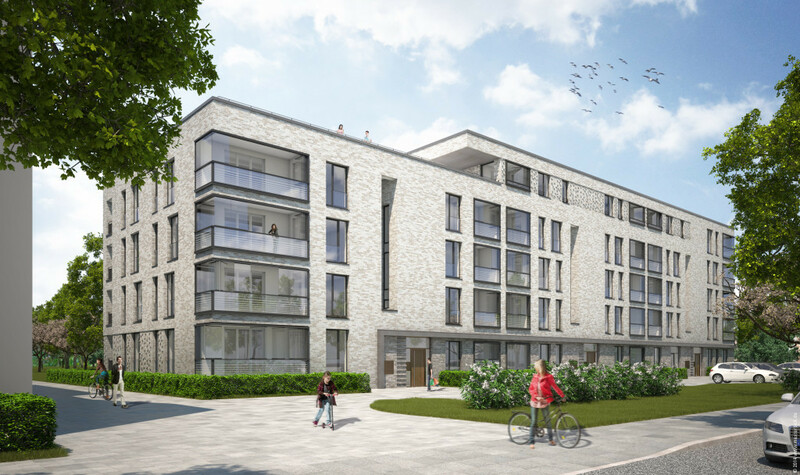 Parkquartier in Hohenfelde Hamburg: A large-scale urban redevelopment in Hamburg featuring a senior’s day care and high care facility at the base of an apartment building. Run by a charitable foundation, it is a government supported program that cares for residents within the surrounding neighborhood to reduce social isolation issues. Sukhavati Zentrum fur Spiritual Care in Bad Saarow: Based around the Buddhist faith, this development features a senior’s community, hospice and respite care centre within the one place. Whilst it has no specific day care program, it offers a number of external opportunities with the wider local area to ensure that seniors remain engaged and socialise. Both of these proposed solutions are currently done in Australia to a degree. We are challenging our clients to consider ways in which they can incorporate aspects of both within their developments; to start thinking about them now, so that they begin to come to life within the next five years. We need to consider how senior’s facilities are weaved within the local area. One option is incorporating senior’s facilities as part of community-based buildings. If you have a care building, it is time to consider ensuring it has a mixture of uses that service the whole neighborhood, including seniors. We also need to shift the government’s thinking in providing support in this area. We need to be able to offer solutions or extra programs for seniors where possible, whether this be government or socially funded. Can we adjust the current home care packages to allow for seniors to choose what they spend the money on? Let’s look at an option that allows residents in any type of care to choose how to use their care package. With the government encouraging seniors to live at home for longer, we need to consider the potential social outcomes, how this could result in isolation and how to make it easier for seniors to access care provision within their own home. Let’s learn from what we have seen in Europe and begin addressing these issues now. We need to explore new options of senior’s hubs and higher care support to ensure that in five years from now, our seniors remain supported as they hit the 70-year-old mark.